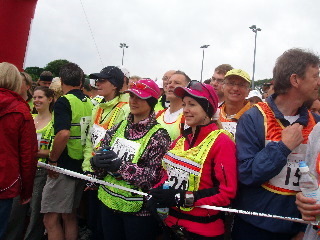 Ultra-unique Bethany Clague completed 2 laps of the Parish Walk at 7:20am on Monday. Brilliant Bethany, well done -- well done to your supporters as well. Bethany pictured here with our Chairman, Colin Watterson. 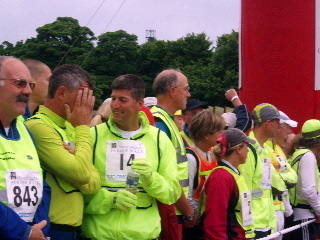 Well done to Jock Waddington for finishing first in the very wet CMI 2008 Parish Walk. 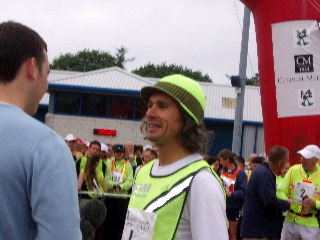 Jock's time was 15:44:43, with Robbie Callister 2nd in 16:09:12. 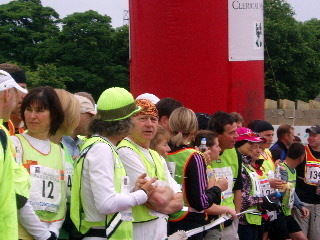 1st Lady Finisher was Sue Biggart, 16:42:09. 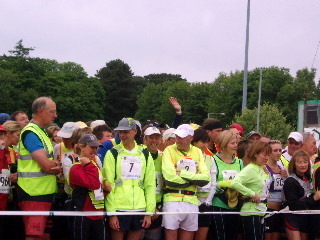 All smiles at the Start! 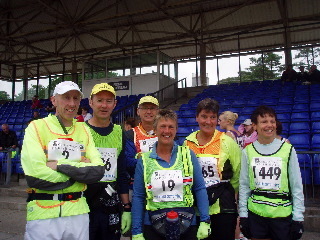 (L to R) Sean Hands, Mike Gellion, Simon Cox, Roey Crellin, Anne Oates & Wendy Ross. Robbie (1) in a fancy hat! Alan Kinvig to the right of Robbie in that hat! 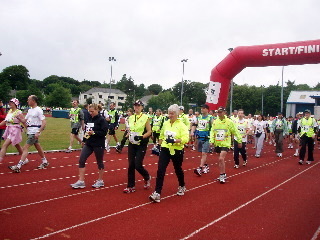 They're off at 8AM in the dry, but the rain started shortly after 9AM & just got heavier & heavier! Well done to all.